Crystal Palace have agreed a fee with Paris Saint-Germain for Yohan Cabaye and remain hopeful of persuading Swansea to sell Ashley Williams. Cabaye is still to decide over the move to Selhurst Park with West Ham also interested but Palace have agreed to pay a club record £10million rising to £12.8m. 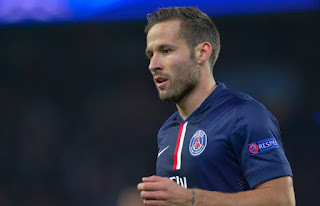 Since moving to PSG in January 2014, Cabaye has played just 967 minutes in Ligue 1 with 13 starts and 11 appearances as a sub. Of those 13 starts, he only played the full 90 minutes once. On Saturday, Palace co-chairman Steve Parish spoke openly about the club's attempts to sign Cabaye on talkSPORT. Cabaye moved back to France in a £19m deal from Newcastle - where he worked with Palace manager Alan Pardew.